Colorful paper pom poms hang from the ceiling of Niles Middle School teacher Meghan Partridge’s classroom. Beneath the bright display, students sit in bean bags, on exercise balls and in over-sized chairs as they do their work at brightly painted coffee tables and TV trays that now replace traditional school desks. “I was also inspired when I heard Ron Clark speak at a convention. He stressed the need for children to get up out of their seats in order to stay engaged and energized. 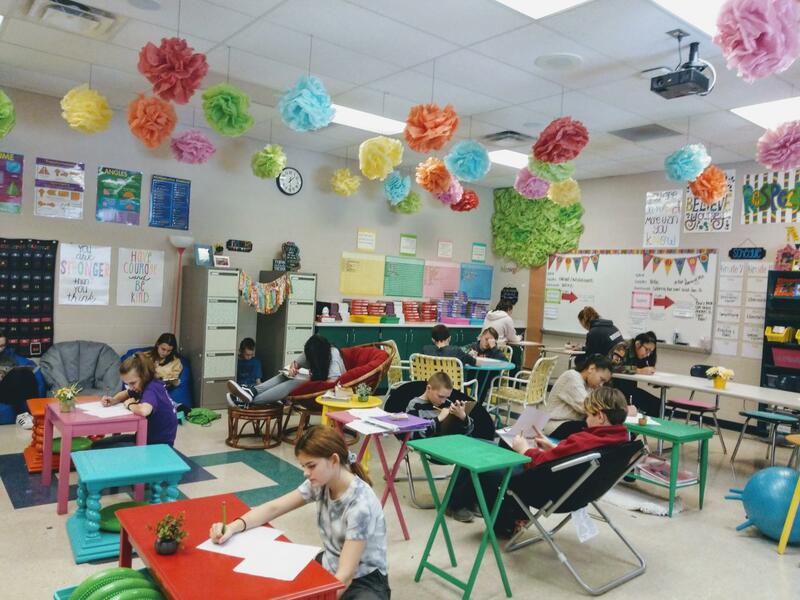 Over the years, I have created activities where students are out of their seats and it got to the point where the desks were actually a hindrance. I found that some students performed so much better when given the opportunity to move, to stand or to sit on the floor,” said Niles Middle School teacher Meghan Partridge. Partridge, who teaches seventh and eighth grade math, turned to DonorsChoose to fund most of the makeover. On the weekends, she would scour flea markets looking for tables and stools, all of which she painted by hand. Her family and friends also donated items to her room, which helped her vision come to life. 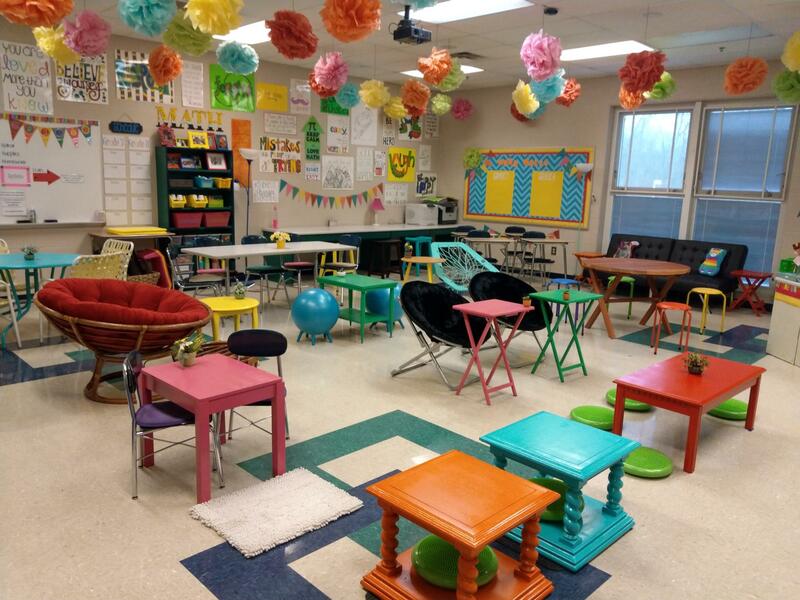 “I have always tried to create a warm, inviting, safe and comfortable atmosphere in my classroom. I want students to feel safe, to make mistakes, to have fun and to be motivated to do their best work,” said Partridge. According to Partridge, the flexible seating empowers students by allowing them to choose their own seat, which has improved student engagement. The flexible seating allows for comfort. Studies show students who are uncomfortable are often distracted and unproductive. The open floor space is conductive to collaborative learning. Students have ability to get up and move, to share with peers and discuss as a whole class. The flexible seating arrangement also encourages students to take turns and learn patience as they choose different seats every day. It has fostered higher-order thinking skills like conflict resolution and problem solving. The stimulation of certain furniture (the bungee chair, bouncy balls, wobble cushions) is helpful to students with ADD, ADHD and ASD. Overall, Partridge says the classroom makes learning fun and enjoyable. “The students absolutely love their new room. They seem comfortable, engaged and proud to take care of their learning space. They are excited to come in everyday,” said Partridge.